I’ve been in a bit of a reading slump, mostly because I just wanted to go sit in my car and finish Harry Potter and the Goblet of Fire, beginning but not sticking with a few books in the last week. 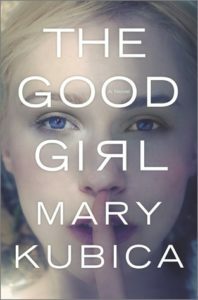 The Good Girl finally hooked me from beginning to end. It’s not Gone Girl but it has a certain level of suspense to keep most readers interested. Mia Dennett, the adult daughter of a prominent Judge, is kidnapped at the beginning of the novel. Her mother, Eve, is frantic even though she no longer has a close relationship with her daughter. Detective Gabe Hoffman is quickly brought in to investigate. We know Mia makes it back but the mystery is how. She comes back months later with amnesia, she also calls herself Chloe. We have three narrators- Gabe, Eve and Mia’s kidnapper, Colin- who tell their version of events in flashback and present day. Colin was hired to kidnap Mia but changes his mind last minute on his way to the drop-off. Worried about the price on his head as well as heat from the cops he takes Mia to an abandoned cabin and tries to come up with his next move. Mia only tries to escape once and Colin eventually begins offering her small freedoms, they form an understanding of sorts as their cohabitation continues. Colin had a sympathetic back story and his eventual understanding/ relationship with Mia makes the reader unsure which side they’re rooting for. Eve and Gabe begin to form a close relationship as Eve’s relationship with her husband crumbles under the weight of a missing child. Not that he was an A+ father to begin with. After Mia is found they remain in contact, enlisting a shrink as well, all trying to figure out why Colin kidnapped Mia, why he didn’t ransom or kill her and why she has suffered from memory loss upon her return. The ending has an interesting twist. Suspense fans won’t be disappointed and if they are it’s a quick read so they can’t complain that much. Share the post "Stockholm Syndrome"